Totally was unprepared for making dinner tonight. I normally have my meals planned for the week but it was a hectic week and with getting ingredients for the Daring Cook’s Challenge and all the other things I had going on, prepping for dinner totally slipped my mind. Lucky for me, I had a few hours before dinner time, to figure something out. 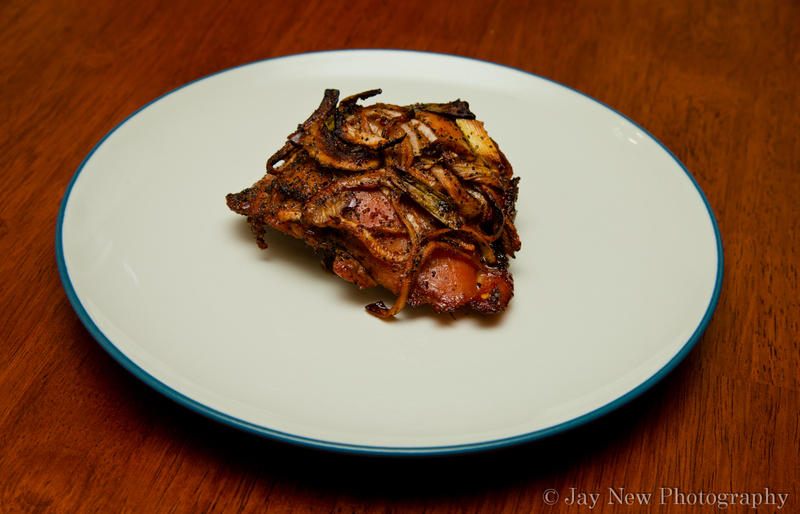 I quickly defrosted some chicken thighs from the freezer and thought, how will I make these. Then I remembered! I used to make a bulgogi styled beef strips, when we used to BBQ at my parent’s house. I remembered how much my husband LOVED the beef flavor. I also remembered how my grandmother absolutely loved this, when I used chicken strips instead. Why not use them for chicken thighs? The best part, is that there is a short marinade time (about 30 minutes) because the flavors are strong. 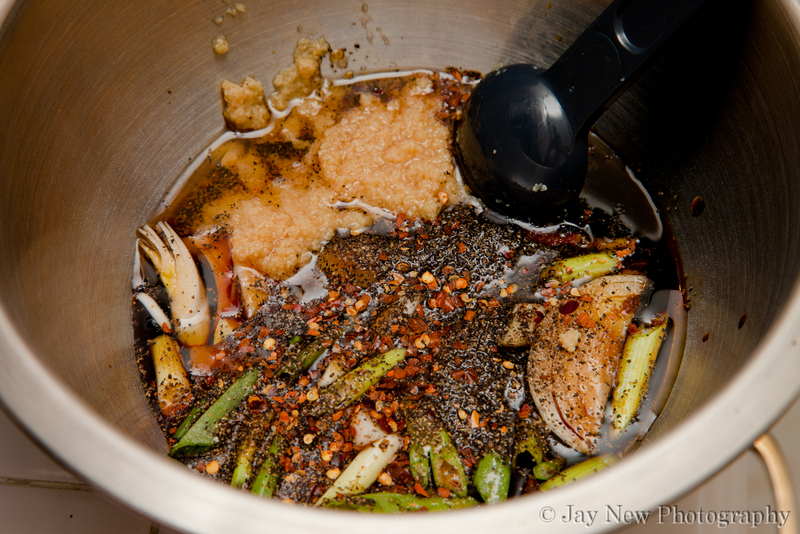 So, I started mixing and chopping and quickly, the marinade was made. My husband came to the kitchen and asked what I was making. As soon as I mentioned Bulgogi marinade…he got excited and ran for his camera. In the end, this dish turn out better than anticipated. I ended up marinading it for about 2 hours and then baked it. I am definitely going to make this again! Please let me know, when you do! I hope you enjoy it! A Korean recipe? God, you are really exotic!!! Awe, you are so nice 🙂 Although, my family background is Indian, I love foods from all over the world. Nothing gives me a thrill as trying to make new cuisines. Maybe, one day you can give me inspiration, from where you live. I hope you enjoy this recipe! Happy Cooking! I would love you tried out to make a recipe from Spain, my country! I think we have very very good gastronomy. Check it out, and decide! I would be more than happy to try some recipes! I have a very good recipe book from Spain. My sister give it to me, when she visited Spain. Please email me recipes!!! Saminacooks@gmail.com! I look forward to hearing from you! I love this! This recipe is new for me but I will definitely try this out this week. I just brought some chicken thighs and legs , so thank you for helping me figure out what to do with them. I’m telling you, RR missed out girl. *HUGS* What would I do, without your daily kind words and support. I love this dish! It is spicy, sweet and salty at the same time. If you don’t use thighs, you can easily marinate chicken breast, beef strips etc and grill them or pan fry them (I used to use the foreman grill). They make excellent appetizers too, when cut into bite sized pieces. Yum. This looks/sounds great. I used to have a roommate from Korea and she would make bulgogi. I have not had it in probably 5 years. I became addicted to bulgogi, in Manhattan. There is an area called “Korea town” and it is filled with restaurants. This is my favorite dish, so naturally, I decided to make it 🙂 Of course, bulgogi is normally used with beef but it tastes wonderful with chicken!